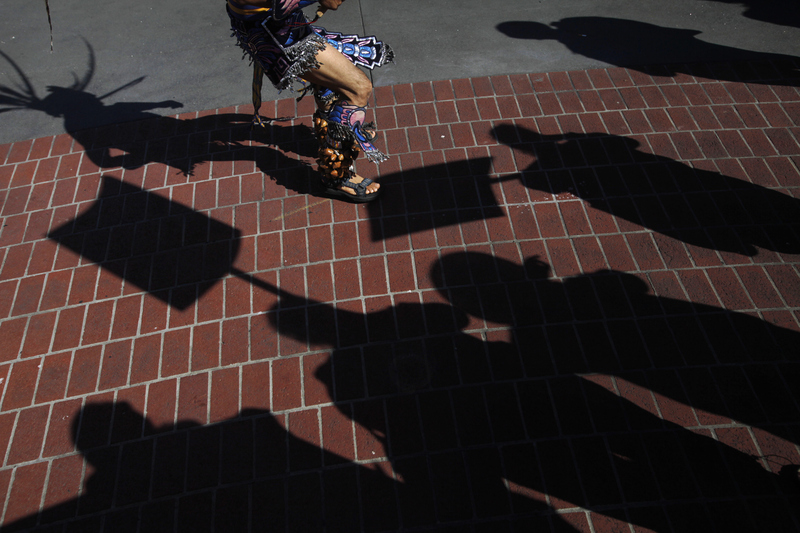 Jose Esteva performs Danza Azteca with other members of various groups during a rally and march coinciding with May Day (a day that historically recognizes workers) called "The Community Fights Back!" May 1, 2014 through the Mission district in San Francisco, Calif. Hundreds of people participated in the rally and march which took participants down Mission street, ending at 16th and Mission. Organizers were protesting evictions, gentrification, police brutality, privatizing public spaces, unlivable wages, environmental destruction and war. Multiple people were arrested after the march was over after they would not leave the street.